The movie takes place in a gorgeously stylised rendition of New York City. First we're introduced to the various pets in a funny scene that was used in the film's early trailers. The story then focuses on Max (Louis C.K. ), a terrier who is deeply attached to his owner, Katie (Ellie Kemper). But when Katie brings home Duke (Eric Stonestreet), a much larger dog, the two start fighting and eventually find themselves lost in the city. Trying to find their way home, they come into conflict with the Flushed Pets, a gang of abandoned animals led by a white rabbit named Snowball (Kevin Hart). 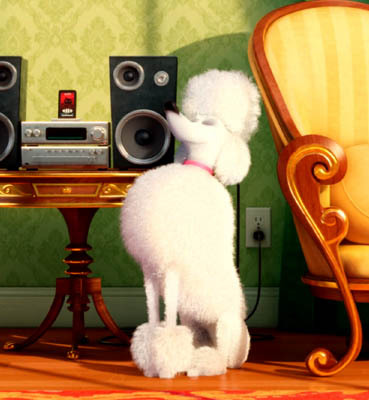 Meanwhile, one of Max's neighbours, a Pomeranian named Gidget (Jenny Slate) gathers together the other neighbouring pets to look for Max and Duke, including fat cat Chloe (Lake Bell), hungry hawk Tiberius (Albert Brooks), and elderly basset hound Pops (Dana Carvey). 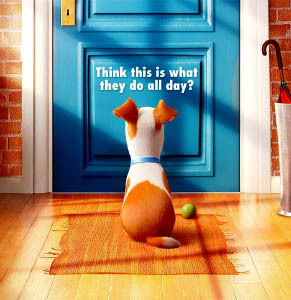 The Secret Life of Pets is approximately the 1,254,783rd Hollywood animated movie since Toy Story to be a comedy about two mismatched characters going on a journey, meeting lots of wacky side-characters along the way, and learning to appreciate each other by the end. The story and its characters are beyond generic… but regardless, it was so gosh-darned charming thanks to its colourful aesthetics and choice of subject matter, that I ended up enjoying it quite a bit. The animals' animations are all very expressive, bringing out their unique personalities; although if you want to see them engage in animal or pet behaviour, it doesn't happen much. The opening scenes offer some fun moments with the two dogs – Max pining for his owner at the door, or expressing joy over finding a lost ball – but these more or less stop once the adventure gets going. 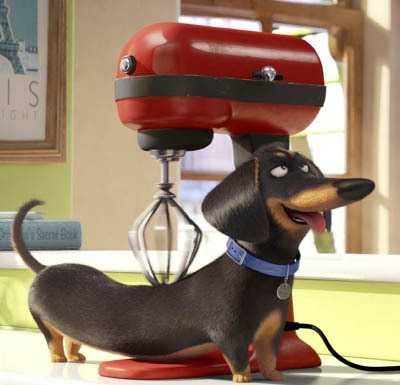 Still, I found myself loving their character designs, especially Max, who is the most adorable little cartoon dog I think I've seen in a movie. I watched the film in 3D, and while the effect doesn't benefit the action all that much, the city itself is stunning to look at. I said "gorgeously stylised" earlier, and I stand by that statement. The film opens with a sweeping pan above the city in what can best be described as a "feels like flying" moment; you can see how different sections have been made more utopian in appearance, from the painted residential apartments to the multi-coloured trees in Central Park. And in many scenes, the city skyline is used as a backdrop to show how big the city is, and how cool it would be to have that as a view while you're walking or cycling. It's another great example of Illumination capitalising on its talented art designers to create a pleasant visual experience. If it appears that I've been vague and saying very little about the story of The Secret Life of Pets, it's because there really isn't all that much to talk about. This is one of those comedies where a lot of wacky but inconsequential things happen, and there's little personal growth for its characters. It's an Illumination Studios movie, which means whether or not you'll like it depends on how much you were charmed by its concept and visuals. If you saw the trailers and thought, "That looks like it could entertain me for 90 minutes", then you'll probably like the movie. I think kids certainly will; the young children in my local cinema were very well-behaved. But overall, Despicable Me still stands as Illumination's best film. Here's hoping their second 2016 film, Sing, can offer something more substantial. This is one of two reviews of this film that were submitted earlier in 2016. For the other one, check out Dronon's review! The movie's weakest link is Snowball. It's not so much the actor at fault - I think Snowball is just a very poorly written character who fell flat and meshed very poorly with the rest of the cast. Really? Personally I loved Snowball, he was a fun bit of derangement in an otherwise unremarkable film that yes felt too much like Toy Story. He's probably the only reason I remember anything about that film, it's pretty forgettable in general.